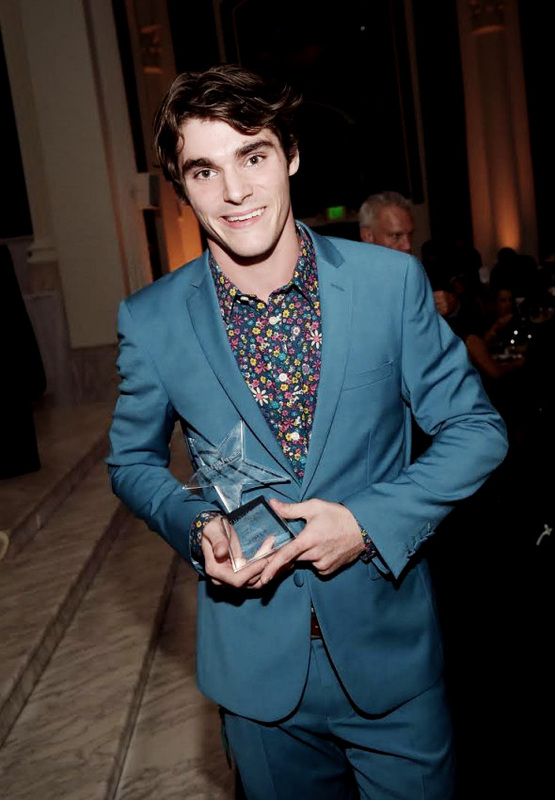 Starlight Children’s Foundation, a leading global charity that partners with experts to improve the life and health of kids and families around the world, presented awards to RJ Mitte, the Koz Family, Ido Leffler and CBS EcoMedia at the 2014 Starlight Awards. More than 400 people attended the gala event at the historic Vibiana in downtown Los Angeles. The gala benefit celebrated philanthropists, innovators and leaders who play an important role supporting Starlight’s mission. RJ Mitte (“Breaking Bad,” “Switched at Birth”) received the charity’s inaugural Starbright World Inspiration Award; the Koz family including Grammy-nominated saxophonist and radio host Dave Koz, businesswoman and philanthropist Roberta Koz Wilson (Audrey’s/Cookies for a Koz), entrepreneur, composer and producer Jeff Koz and the family’s late, inspirational matriarch Audrey Koz – were honored with the Founder Award; social entrepreneur Ido Leffler (Co-founder of Yes To Inc., and Co-founder and CEO of Yoobi) was presented with the Innovator Award; and CBS EcoMedia was the 2014 recipient of the General H. Norman Schwarzkopf Leadership Award. During his acceptance speech for the Innovator Award, Ido Leffler announced a partnership with Starlight Children’s Foundation through its Starlight Wish List platform, the world’s first online giving marketplace created by Starlight last year. Beginning this November, for each product purchased on Yoobi.com, Yoobi will donate an additional item to Starlight Children’s Foundation. Through this partnership, Yoobi’s bright and colorful supplies will be distributed to school programs within children’s hospitals nationwide, affecting more than 30,000 kids in the New Year. Accepting his award, RJ thanked Starlight saying, “I am truly moved to receive the first-ever Starbright World Inspiration Award from Starlight Children’s Foundation, and to be recognized for something I enjoy doing so much and something that gives back to me ten-fold.” Excerpts from our Legendary Issue 7 Behind the Scenes video with RJ Mitte were screened at the ceremony alongside RJ’s speech. For our exclusive interview and photo shoot with RJ, click here.